Research suggests that between 1-30% of the global population suffers from some form of anxiety.1 There are 13 different sub-classifications of anxiety disorders listed in the latest Diagnostic and Statistical Manual (used by medical professionals to diagnose and treat psychological conditions),2 with symptoms and physical manifestations varying considerably. From shortness of breath and variations in heart rate, to full blown and debilitating panic attacks, headaches, pain and insomnia,3 anxiety is a complex, pervasive condition that is generally treated using medication. The autonomic nervous system (ANS), which is comprised of the sympathetic nervous system (SNS) and the parasympathetic nervous system (PNS), regulates the internal conditions necessary for existence (homeostasis). (8) Information is received from the body and external environment and a response is delivered by either the SNS, which releases excitatory signals, or the PNS which releases signals for relaxation. These signals direct the body to react in very different ways, such as increasing the heart rate and contraction force, or by reducing blood pressure and slowing the heart rate. (9) It is exciting to know that studies show acupuncture has an effect on both the SNS and the PNS, as some further examples presented below reveal. 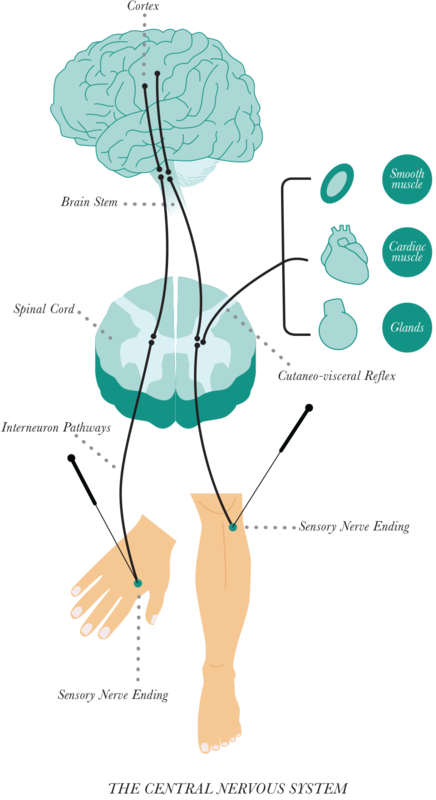 All of these acupuncture mechanisms have a direct effect on reducing anxiety. The conventional treatment of anxiety primarily involves some combination pharmacological and psychological interventions. While there are ethical and methodological challenges to designing studies that compare the effectiveness of acupuncture to the conventional treatment of anxiety,23 24 the best available evidence demonstrates that acupuncture has moderate benefits in the treatment of anxiety. Studies show that acupuncture is more effective than pharmacotherapy and comparable to talking therapy, making it a helpful referral choice. Moreover, research has revealed several known biochemical and biophysical mechanisms that may offer an explanation of how this ancient modality works. Kylee Junghans is a registered acupuncturist in private practice in Victoria, Australia. She has a Bachelor of Health Science (Acupuncture) and a Master of Public Health (Griffith University School of Medicine). She is the co-founder of the world’s largest online acupuncture research share group (almost 10,000 members). Her areas of interest include pain management and mental health and she is passionate about developing the role of acupuncture in primary care in Australia. 4. 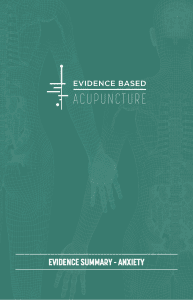 McDonald J, Janz S. The Acupuncture Evidence Project: A Comparative Literature Review. Australian Acupuncture and Chinese Medicine Association Ltd. 2017. 5. Bazzan AJ, Zabrecky G, Monti DA, Newberg AB. Current evidence regarding the management of mood and anxiety disorders using complementary and alternative medicine. Expert Rev Neurother. 2014;14:411- 23. 6. Goyata SL, Avelino CC, Santos SV, Souza Junior DI, Gurgel MD, Terra FS. Effects from acupuncture in treating anxiety: integrative review. Rev Bras Enferm. 2016 Jun;69(3):602-9. 10. Guo ZL, Longhurst JC. Expression of c-Fos in arcuate nucleus induced by electroacupuncture: relations to neurons containing opioids and glutamate. Brain Research. 2007;1166:65–76. 11. Ribeiro SC, Kennedy SE, Smith YR, Stohler CS, Zubieta JK. Interface of physical and emotional stress regulation through the endogenous opioid system and m-opioid receptors. 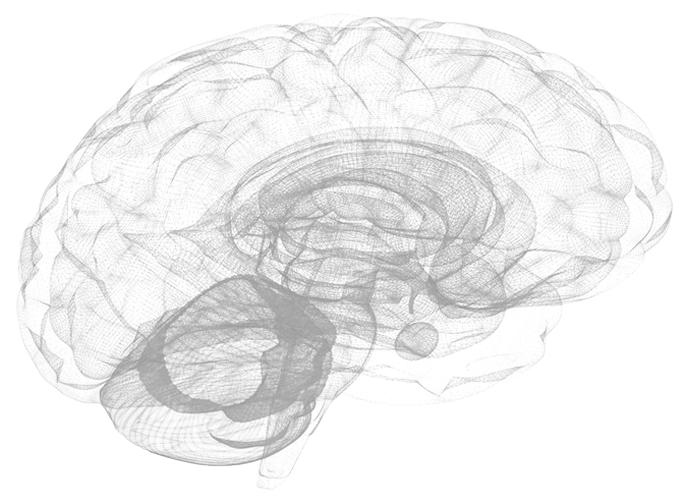 Progress in Neuro-Psychopharmacology and Biological Psychiatry. 2005;1264-1280. 19. Perna G, Alciati A, Riva A, Micieli W, Caldirola D. Long-Term Pharmacological Treatments of Anxiety Disorders: An Updated Systematic.